Organic or Non-Organic? Do you know what you’re eating? Organic or Non-Organic? Do you know what you are eating? Today I want to ask the question… organic or non-organic? Do you go shopping at a specific place or get a vegetable box delivered because you know you will get organic? Do you go to a regular store with the intention of buying organic… only to find that actually you are very limited in your selection!? Or, maybe you have never thought about how your food is grown and what pesticide residues are actually in it?! “This study demonstrates that choosing food produced according to organic standards can lead to increased intake of nutritionally desirable antioxidants and reduced exposure to toxic heavy metals” (www.ncl.ac.uk press release). Yesterday we conducted an experiment! 🙂 We visited the largest branch in our town of each of the five major supermarkets in the UK. Our discovery? Only ‘one’ of the chains had what I would call a ‘decent’ selection of organic fruits and vegetables… but not enough to get us through a few days let alone a week! It wasn’t that they had run out of stock, rather that they didn’t even stock organic! We were looking for what we think as standard items such as broccoli, green beans, bananas and apples to name a few and we discovered that for fruits it was slighter easier to buy organic but vegetables were generally met with a shake of a head and a ‘sorry no we don’t do that in organic’! Of course, there is then another issue of freshness (and price) as until more people opt for or request organic, the organic produce which is available will stay at a premium price and also might have seen better days like these poor samples we saw! What do you think? Organic? Non-organic? Depends? Organic is also kind of a you get what you can get kind of thing around our parts. But fortunately, we also have a few decent natural food stores that will buy decently prices organic foods. I think for us, we’ve learned to just buy and then plan our meals. We use to leave home with a list and “hope” we would find what we needed. Now, we go to the natural food store, we look at what is nice, what is affordable and then decide what we will eat that week. We’ve found ourselves less frustrated that way. Also, living in such a cold climate (Eastern Canada), we tend to have a lot of hot house veggies which although they are not organic, they are often non GMO and pesticide free so when we can’t do organic, at least we have that! But I need to stress here that we are also homesteaders and produce about 50% of all the food we eat. So that helps a lot as well. Hello, sorry it took me a few days to respond. We have almost 1000 sq.ft of gardens in our 1/3 are property. In addition to veggies, we have fruit trees, herbs and I’ve started a medicinal garden that will top off at 20 species this year. We usually garden from Early May to Late Fall (that always depends on snow – so anywhere between mid-oct to mid-nov). Fail safe, you mean for if our production doesn’t work out as well one year? We have CSAs in our areas and amazing farmer’s markets, so those are pretty much our safety nets if ever a year turns out blah (like 2 years ago). Do you have a garden? That sounds like a wonderful challenge! Also, have you ever thought about sprouting? It’s a GREAT way to garden year round and have fresh sprouts for wraps and salads all the time. All you need is a Mason jar and a piece of cheese cloth. 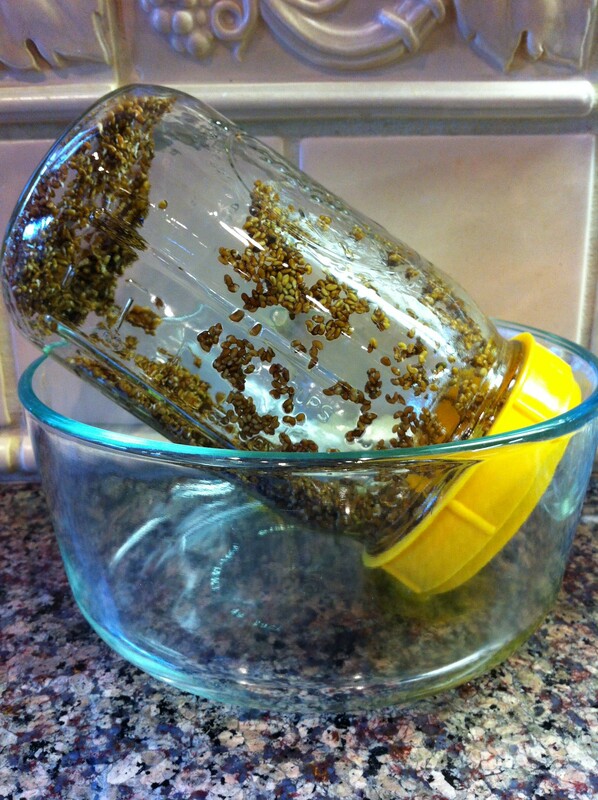 This is the way I do it : Soak seeds for about 6 hours. (most packs say 2, but I’ve had better results), rinse and them place in jar. I tie the cheese cloth with a rubber band (using the Mason lid will create rust) and store them in the dark upside down at a 45 degree angle. I usually use a bowl (kinda like this : http://plantifulwellness.com/wp-content/uploads/2012/08/sprout2-e1344387951774.jpg). I keep mine in the dark until they grow about 1/2 inch long. Rinse every 12 hours. When they have reached that 1/2 inch. put them in the sun fr about 12 hours. The chlorophyll comes in and they get all bright and green. Just wonderful. When they are ready I rinse, dry and put them in a glass container in the fridge. Mine will last 5 days (if we don’t eat them all that is!) So to have a constant supply, the moment I put some in the fridge, I soak the next batch sine they take about 3-5 days to be ready. The last thing is get quality seeds! Totally worth it. My hubby & i hire an allotment since October 2014. We are trying to be organic gardeners. We think that is very important! But not every food has to be organic, I reckon!